Attack of the Angry Squirrel! I was upstairs looking for some bandages for my 9-year-old daughter’s skinned knee, when all of a sudden I heard a blood-curdling scream, “There’s a SQUIRREL in the bathroom!!!! !”, followed by running footsteps. I ran downstairs to find Molly standing, breathless, pinned against the hallway wall with saucer-sized eyes and racing breath. From the bathroom – door now closed – I heard the unmistakable sound of a small, terrified animal running, jumping, and knocking things off shelves in a desperate but vain attempt to find an escape from this white prison! Being the brave but animal-loving hunter that I am, I entered the prison cell with thoughts of gently coaxing the unwanted captive to freedom. He would hear nothing of it. Quicker than jolly old Saint Nick, the little grey fuzzball jumped from the floor to a 5-foot-high wall shelf, to another on an adjacent wall, then along the counter, before scurrying up the open medicine cabinet and into the farthest corner of the top shelf…where it crouched and chattered and tried to hide. I opened the window, surveyed the situation, then went out and closed the door. I hoped he would smell freedom in the fresh air wafting from his exterior home, and would run out on his own. In the meantime, I donned my best protective gear: thick denim jacket, leather gloves, and the “Indiana Jones” hat (nothing like his, really) that had so recently protected my head in Liberia. I also got a broom to help with the coaxing. My son Morgan, always ready to help(?! ), started loading his 400-feet-per second air soft rifle with sniper scope, but I wasn’t quite ready for that. Reentering the cell, there was my scared little friend, still huddled tightly in the corner of the medicine cabinet. (I’m still not sure who, at this point, was more scared: the squirrel or my hyperventilating daughter!) The broom handle, prodding ever so gently, did nothing but make the squirrel hoarse with chattering. I called for a net…which, of course, no one could find. A cardboard box was found, though, and I tried for several minutes to coax, prod, bump, or startle the little antagonist – not so much a friend anymore – into the safety of the dark box. He, of course, was having none of it. Ten minutes later, with no progress having been made on either side of the bathroom door, I once again left. Now I was on a mission; I was going to get that thing out of the house one way or another. I looked briefly for some wire, thinking about making a snare, but couldn’t find any. Instead, I found the fishing net and returned. I also took Morgan’s air soft rifle as an absolute last resort. (Air Soft, by the way, is similar to paint ball, but without the paint. It uses plastic pellets that, from a distance, won’t do much more than raise a welt on a person. I’m not sure what a rifle would do to a squirrel at point blank range, though, and I was really hoping not to have to find out.) 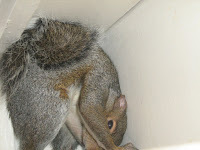 I also took the camera with me and set it on a shelf, hoping to capture the excitement…and the squirrel! After several more minutes of coaxing, poking, prodding, and sweeping with both ends of the broom, the squirrel finally jumped out of its corner right into my waiting net, where it scrambled as much as it could to get free. I held the broom above and moved quickly to the open window. Holding the net out, I realized that there was no roof overhang below…just 25 feet of air above the wood deck below. Having not studied squirrels prior to this, I had no idea what would happen to it if I just dropped him. And I didn’t particularly want to find out. You can watch most of this. The audio isn’t particularly exciting, but you can hear the squirrel growling!. The real action takes place in about 30 seconds halfway through, but here is the uncut, unedited, unscripted real reality TV! This entry was posted in Home Life on November 1, 2008 by Randy Ehle.